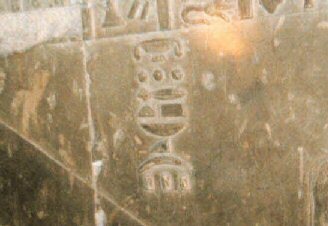 Denderra: (The 'House of Hathor'). The Temple of Hathor at Dendera was found originally buried in sand. 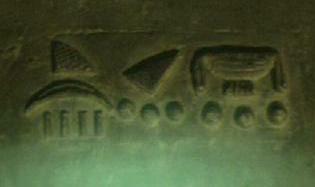 It includes astronomical representations of the constellations, the zodiac symbols and several interesting hieroglyphs. 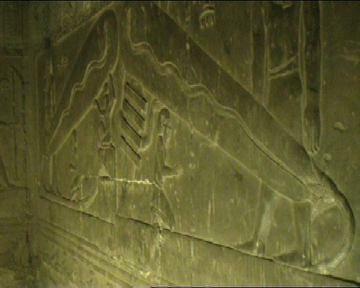 The catacombs that run under the temple contain the enigmatic hieroglyphs and inscriptions so often quoted as being 'electric light bulbs'. 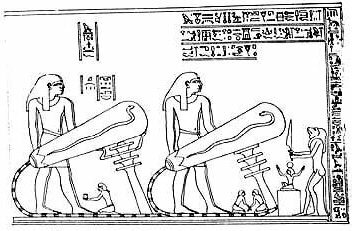 While it is true that the definitive interpretation of these hieroglyphs is still uncertain, one has to ask of people who prefer to see them as literal images, why electric bulbs would have physical snakes inside them. 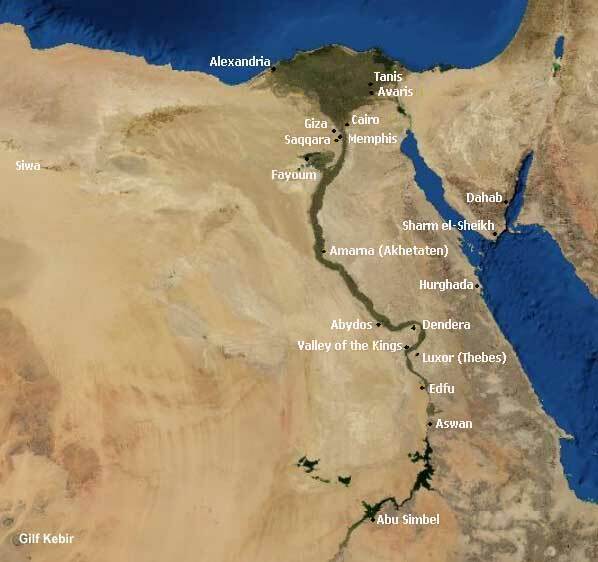 Ancient Egyptian Iunet or Tantere, known to the Greeks as Tentyris, was the capital of the 6th nome of Upper Egypt and a town of some importance. Today, we know it as Dendera. It is one of the best preserved temples, if not the best, in all Egypt. 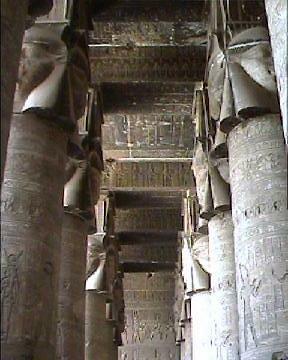 The Temple of Hathor at Dendera contains numerous astronomical images within the complex. The temple itself and surrounding buildings are cardinally orientated. 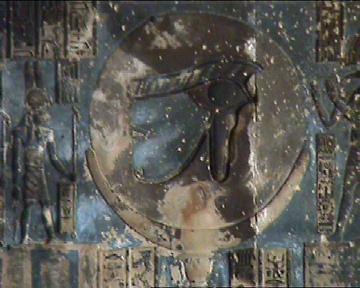 The ceiling is decorated with vultures, winged disks, and the union between Hathor and Horus. The colours are beautiful and are mostly still original. The rest of the ceiling is a symbolic representation of the north and south halves of the sky, the hours of day and night, the constellations and the regions of the moon and sun. The bays to the right show the northern stars while the left shows the southern stars. The figures of Nut dominate each end of the hall. The continuing cycle of a day is represented by Nut. Her dress is the sky; between her legs is the birth of the sun, which disappears at night as she swallows it. 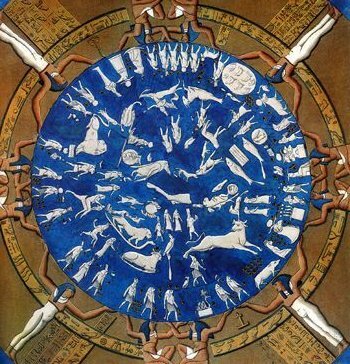 The now famous zodiacs discovered at Dendera show constellations mostly similar to those still used today. 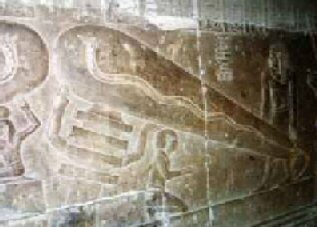 The largest display covers the ceiling of the entrance hall of the temple of Hathor, and includes much astronomical information alongside images of mythological creatures, deities and symbolism with meanings only guessed at today. Although the original is now in the Louvre in Paris, a plaster replica is still to be seen at the temple. 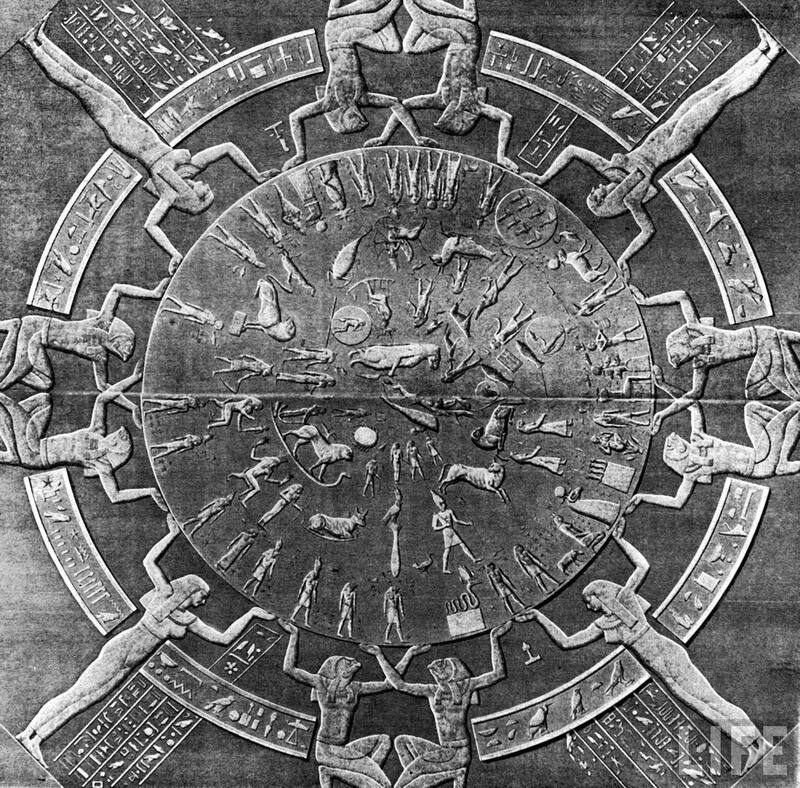 The 'round' zodiac was carved onto the ceiling of a room, it is a planisphere or map of the stars on a plane projection, showing the 12 constellations of the zodiac , some of which are represented in the same way as they are today (e.g. the Goat (Aries, The Bull, Taurus, The Scorpion, Scorpio and Aquarius, the water bearer). 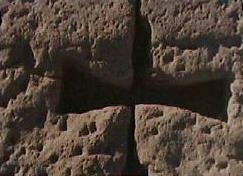 Metal brick-ties (right) - It has been noticed that the builders of the temple of Hathor used metal brick-ties, one of many similar construction features found on ancient structures around the world. The softness of the metal is believed to have prevented serious movement between the blocks. 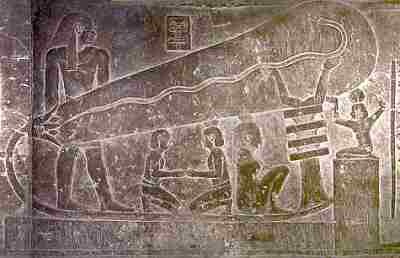 The following pictures are from Dendera and are described as 'offering's'. It is clear from the images that these 'offerings' were being inhaled, which opens a topic of conversation rarely covered in archaeological text books, namely that several Egyptian mummies have been found to contain traces of cocaine. The sanctity and importance of such a place as the temple of Hathor at Denderra suggests that this practice of inhaling such 'offerings' may have been an important part of the priesthood rituals. 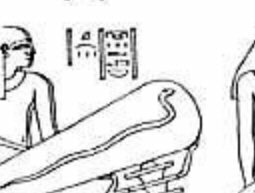 Although this by no means proves that this is what we are looking at here, we are offered a possibly valuable insight into the mind of the Egyptian priest. One of the roles of the goddess Hathor was to support the skies, her four legs representing the cardinal points of the skies. The Temple of Hathor contains 12 underground tombs and chambers. While most are plain and undecorated, some have walls of limestone rather than the sandstone of the temple itself, that are covered with carefully carved reliefs (believed to have been finished before the floor of the temple was laid). The following unique images are to be found at the end of one of the underground tunnels. They have caused much debate in recent times as they remain to be completely interpreted. 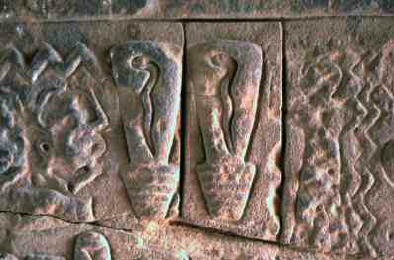 The two large 'bulb-like' objects with snakes in them, have been recently likened to modern electrical appliances (i.e. wires and bulbs etc), In this literal interpretation, we can also assume that pillars had arms, and apes performed surgery.. based modern eyes. their meaning is probably more complex, involving imagery to express a concept rather than a physical object. 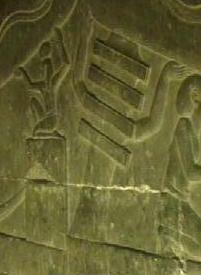 We can see that the 'Djedt' appears to be supporting one of the two 'lamps'. 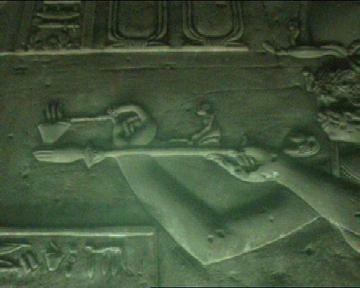 Note: The symbols (Right) are embossed above the image on the left side. And these (with central symbol changed) over the image on the right. 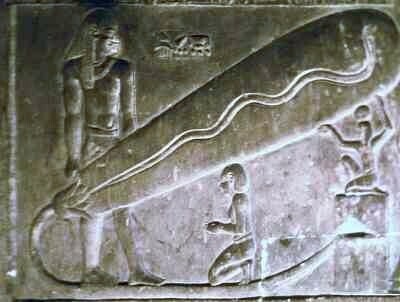 Another image at Dendera follows the same theme, only this time the Djedt pillar is supporting the 'snake' inside, and not the 'bulb'. 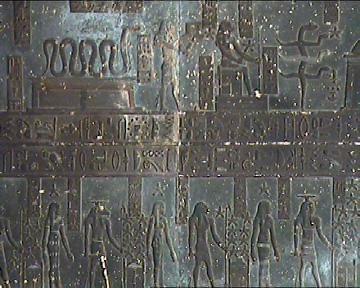 Note: The same set of hieroglyphs over the figure on the left. 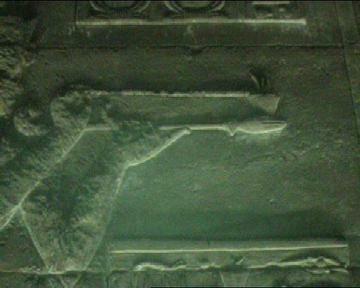 The same two serpentine symbols can be seen elsewhere at Dendera. 4). Moustaffa Gadella. Egypt. 1998. Tehuti Research Foundation. 5). 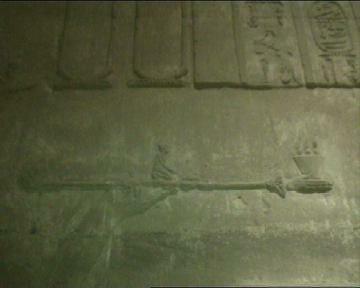 Francois Daumas, Dendara et le Temple d'Hathor, 1969. 6). Ivan Van Sertima, African presence in Early America, 1992, Transaction Publishers.